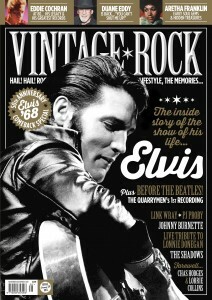 It’s an Elvis extravaganza in the new Vintage Rock as we revisit The King’s ‘68 Comeback Special’, and talk exclusively to the producers and musicians who were part one of the greatest performances in rock’n’roll history! 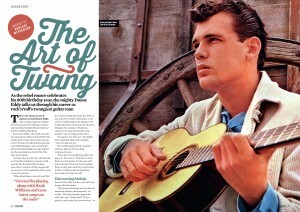 To mark Eddie Cochran’s 80th birthday, we salute the genius of one of the 1950s’ most unique talents. 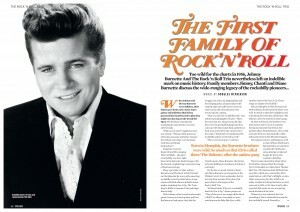 Read Darrel Higham’s own salute to his idol, including his Top 5 Cochran cuts, and we even have photos of the new Eddie Cochran memorial. 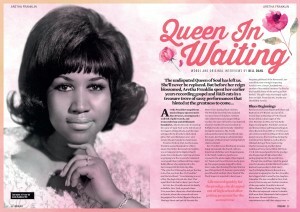 We salute Queen Of Soul Aretha Franklin in Vintage Rock’s own unique way, charting her early rise in the 50s and the crucial but overlooked R&B cuts that still reign supreme today. Talking of early days, The Quarrymen – that’s the pre-Fabs Beatles John, Paul and George – cut their first record 60 years ago. 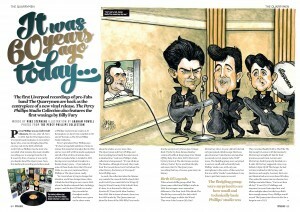 It’s now back on vinyl and we detail the recording of a UK rock milestone. Right up to date, we talk to Duane Eddy – 80 years young and still touring! We meet PJ Proby, who is embarking on a farewell tour… or maybe he isn’t? We tell the tale of first family of rock’n’roll The Burnettes and go backstage at a star-studded tribute to King Of Skiffle Lonnie Donegan. Plus: The Shadows, Link Wray, farewell Lorrie Collins and Chas Hodges, Ritchie Valens, all the new rockin’ releases and more. Find this issue in WHSmiths, Eason’s and independent retailers. Search for your local stockist HERE. « Vintage Rock Presents – Little Richard!